Outbuildings, sheds or Garden offices. In the past we liked to have sheds and outbuildings to store our collection of junk in. These days we want to spend time in them. With todays property prices we all seem to be making a bit more use of our gardens and what best way than to create that extra room. Generally our garden offices, garden gyms or Mancaves/She-sheds all need electricity for lighting and power. With LED lighting power requirements come down quite a lot. then on top of that we'll generally need 13amp sockets, a form of heating and probably an internet connection. To run power down to your garden room the correct cable must be use. We always use SWA armoured cable for the run from building to building. This will protect against the environment and also wildlife damage. That cable must always be protect by at least an RCD. In the unlikely event of somebody cutting into it with a lawnmower for example, it will be protected by automatic disconnection of supply. A 40amp supply should generally be ample to cover the needs of the supply. 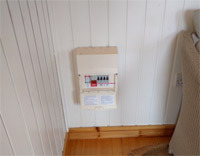 A small consumer unit to distribute the power and to protect the individual circuits. 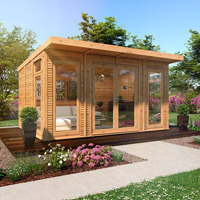 If you have an outbuilding that you'd like to make more use of, we would be happy to offer a free quotation to safety connect it up to provide power and lighting.